Actions per minute have a physical price. Clinton Loomis, known to many by his online alias Fear, had his first experience of arm pain in Dec. 2013. For more than a decade, Loomis has been a professional esports athlete for Defense of the Ancients (Dota) and Dota 2. At tournaments, his reputation precedes him. He is considered one of the best players in the games' history, with multiple first-place finishes in global competitions, earning him six- and seven-figure sums. Similar to traditional sports, the number of people who play Dota 2 is far greater than the number of people who can make a living from it. Professional gaming requires fine motor precision, encyclopedic knowledge and relentless practice. The average gamer plays video games for five to six hours per week. Loomis estimates that at his professional height, he logged anywhere from eight to 12 hours per day playing Dota 2. A professional gamer like Loomis can average hundreds of actions per minute during those hours. There is a sports phenomenon known as overtraining, where training and practicing at high volume, with high intensity, can cause physical performance to deteriorate. The body does not have sufficient time to recover in its resting state, particularly if athletes push through the warning signals their bodies are giving them. In the case of esports, the physical pain asserts itself in small ways at first. "I didn't understand what was going on," Loomis said. "It was an issue with my forearm, and every time I clicked my mouse, I felt a sharp pain in the center of my forearm. It just got worse and worse. Every time I pushed down my finger, it triggered a response." "I saw a lot of doctors," Loomis continued. "And at first, they didn't give me a good diagnosis, because I didn't do a good job of explaining to them what I was feeling. I was initially diagnosed with tennis elbow. I was told to put a brace on and rest my arm." It wasn't tennis elbow, and Loomis still doesn't have an exact diagnosis for his pain, though it's due to the aggravation of his radial nerve. Loomis qualified for The International 2014, a particularly prestigious tournament, but was unable to compete and instead served as the team's coach. He was healthy enough to compete in The International 2015 (which he won) and The International 2016 (in which he placed third). But eventually, the pain became unbearable. On Sept. 14th 2016, Loomis' esports team, Evil Geniuses, announced that Loomis was retiring, "effective immediately," due to his ongoing physical problems. "Today, I'm announcing my retirement from competitive Dota," wrote Loomis in a public statement. "I have been living my dream of being a professional gamer for over a decade now, and in that time I've accomplished each of the goals I placed for myself and for EG Dota." "Now, I have to pursue a new goal -- getting healthy," continued Loomis. "I still have a passion for Dota and for competing, but the long-term health of my arm has to come first." Competitive gaming provides a visible example of an old problem: repetitive motion/strain injuries, which occur when patients habitually perform awkward, uncommon movements and the associated nerves, muscles and tendons, which are unaccustomed to the strain, become inflamed. It's not a new phenomenon; it simply goes by other names depending on the activity or occupation. For example, the condition lateral epicondylitis, which affects the outer elbow and forearm, was originally known as writer's cramp and is now commonly referred to as tennis elbow. But baseball pitchers can also suffer from tennis elbow, due to the torque they need to throw a curve ball. And since the advent of the personal computer and home video game markets, the number of tennis elbow diagnoses -- not to mention other diagnoses of arm, wrist and hand conditions -- has increased dramatically. Dr. Levi Harrison is an orthopedic surgeon based out of Glendale, California. He deals with all manner of sports injuries, but he has found success and name recognition in the past several years as the gamers and esports doctor. Harrison notes that the gaming injuries he sees are not strictly limited to professional gamers; his youngest patient was eight years old and his oldest patient 90. Video games are not only AAA titles on consoles and PC rigs but also apps on smartphones. They are online poker and blackjack websites. They are educational titles for small children. "I take care of everyone from elite gamers to weekend gamers to everyday gamers," Harrison said. "And the major issue I find is overuse. 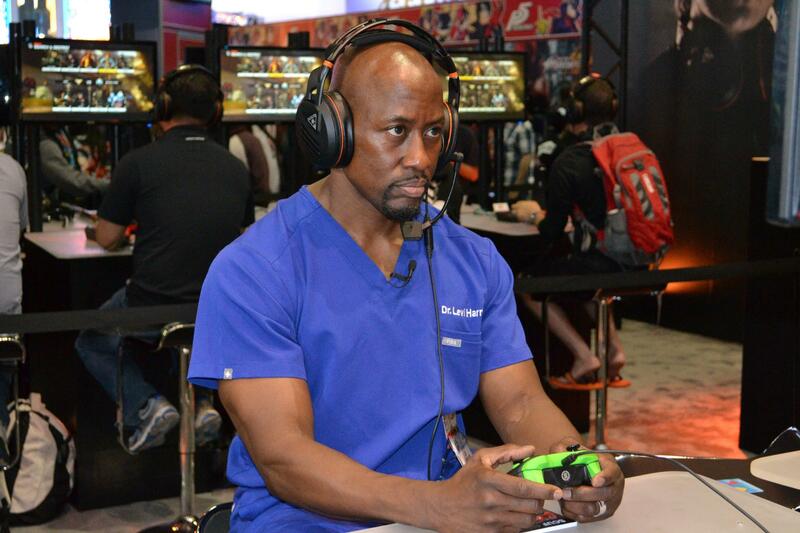 [My patients] are gaming for up to 16 hours a day, especially the elite gamers. They don't have have the proper ergonomic balance of their mouse and their desk, they don't have the proper backrest, or they don't know how to engage their posture. They have to learn how to sit properly and how to place their hands and elbows properly." When he meets a patient, Harrison asks a series of rhetorical questions. "Why should you uncross your legs?" Harrison asked. "Why should you have the monitor a certain number of inches from your face? Why should you change the sensitivity of your mouse?" To best assist his gamer patients, Harrison has them bring their keyboard, mouse or other gaming peripherals to his office, so that he can observe how they typically play. He can then adjust their sitting and posture; if the chair is too high in relation to the desk, for example, the wrists can be hyperflexed. If the chair is too low, the wrists can be hyperextended. Wrists are best situated in a neutral position. Harrison analyzes their gaming so he can recommend a series of warm-ups and exercises. Different controllers, different games and different grips play a factor in this sort of preemptive measure. Does the player use a controller or mouse? If a controller, which type of controller? If a mouse, does the player use a palm grip or a claw grip? Does the player specialize in a fighting game like Tekken 7? Or maybe a real-time strategy game like Starcraft II? Harrison has exercises similar to those a physical therapist might provide, but most of them are specialized and devised by him to be therapeutic for gamers specifically. "Every game has a specific type of stress and its own intrinsic issues," Harrison said. "It's individualized to the gamer as well as the game. If the gamer is using a keyboard, there are often problems with the wrist, elbow and fingers. If the gamer is using a controller, his or her thumb is the major digit that takes the hit." Both Harrison and his patients keep their relationships confidential. Obviously, Harrison has an ethical motivation, but the elite players have a more practical concern: They fear losing their sponsorships or giving their opponents a psychological edge. For these patients, Harrison tries to avoid surgery if possible; it's always a risk, and too much downtime might affect a player's livelihood. Harrison's patients will often fly in to see him, and for those who cannot, he is available for Skype consultations. He also has several videos on his YouTube channel that go over some general stretching and exercise techniques. Any gamer of any skill level can use these to improve their upper-extremity health. But despite the warm-ups, the stretching and the proactive ergonomics, are esports injuries inevitable? What if the traditional mouse is simply not conducive to good health, particularly with high-volume usage? This is what inventor and Evoluent founder Jack Lo was thinking when he invented and patented the vertical mouse. The theory behind the vertical mouse, as seen in the promotional video below, is that the handshake position, versus a palm-down position, is more natural and ergonomically sound, because it does not require the forearm bones to twist and put undue stress on the tendons. Lo came up with the idea while he was working as a patent agent -- a job that required him to create diagrams and detailed drawings with a mouse. He was using a brand-name ergonomic horizontal mouse, where the palm faces downward, toward the desk. "I found myself rotating my hand up to the vertical handshake position to relax and rest it before using the mouse again," Lo recalled. "And I thought that it would be nice to have a mouse that would work that way." Lo patented his idea in 1994, and although some hardware companies showed interest, they all rejected the idea. Microsoft, for example, sent Lo a letter stating, "There are no proven biomechanic effects that we can speak of." Lo was devastated. But in 2001, he decided to produce and market the mouse with his life savings. He worked with a distributor in China to get the mouse on shelves, and to this day, he still does all the design by himself. "It's mostly a one-man shop," Lo said. "When you don't have overheads, a small business like this can still be profitable." Today, Lo's company, Evoluent, is very successful, and his invention has garnered praise from PC World, PC Magazine, TechTV and Business Insider, among others. There has never been a rigorous, clinical study of vertical-mouse design that proves the ergonomic benefits beyond a doubt, but the user reviews, many of which are written by doctors, physical therapists and sufferers of chronic wrist pain, paint a compelling portrait. Evoluent has released five generations of its vertical mouse, and Lo is currently designing the sixth generation, which will be out by the end of the year. "The mouse has proved itself in the marketplace," said Lo. "It's not what I claim; it's what my customers claim. It's what my distributors and resellers tell me: that this is the leading mouse brand in ergonomics." Lo's customer base is mostly comprised of businesspeople and home users. But what about esports athletes? Could a vertical mouse be a viable, competitive alternative to the traditional mouse? Lo states that some gamers have reached out to him, and during the next vertical-mouse release cycle, he plans on manufacturing a gaming-spec version, which he will send out to gamers to gauge interest. Harrison does not endorse the vertical mouse -- he wants to see more scientific backing behind it -- but he believes it is viable in professional tournaments, as long as the player trains with it. "If someone used a vertical mouse for five or six years and that's all they used, then of course they're going to be great at it." 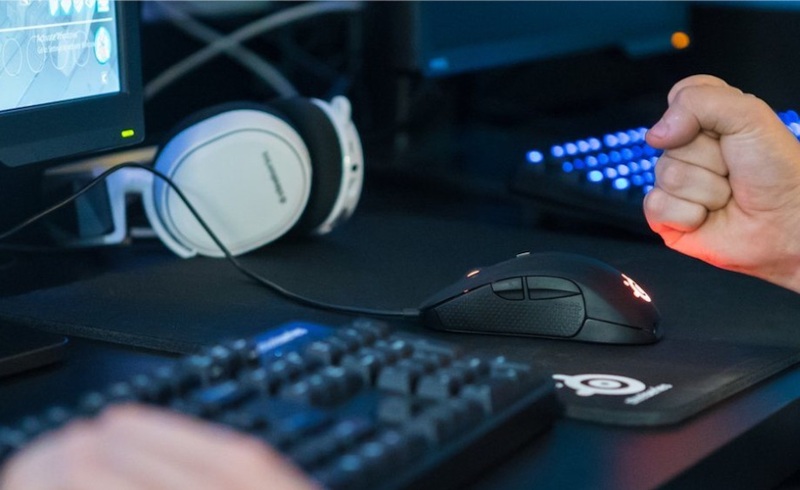 "It can be competitive; if someone used a vertical mouse for five or six years and that's all they used, then of course they're going to be great at it," Harrison said. "But the vertical mouse hasn't been out very long. It's going to take time. Whatever elite gamers practice on most is what they can do well on." Loomis echoes this perspective. He appreciates the idea behind a vertical mouse, but its success in esports depends on a person's experience with it. 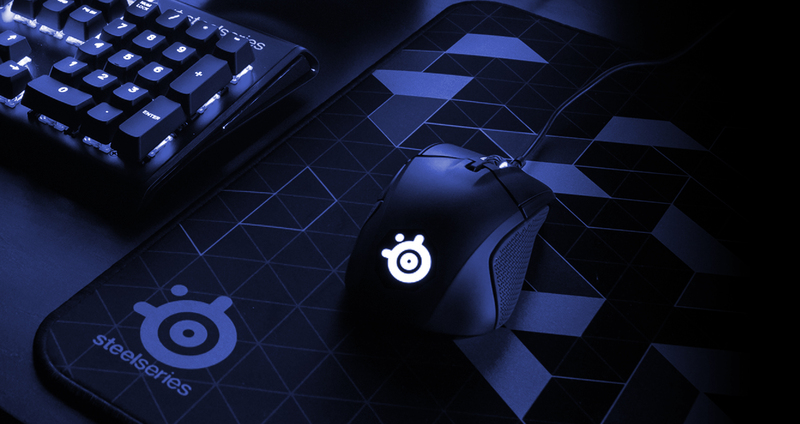 Loomis has been using a horizontal SteelSeries Sensei Raw for the past five years, but he's currently in the process of switching over to a SteelSeries Rival 310. "The Sensei Raw was a smaller mouse, which meant that there was less of an arch in your hand; hopefully, the Rival 310 [which is larger] will take some of the pressure off my carpal tunnels," said Loomis. "I had a thumb problem, and I thought changing my hand posture would be good for me. But it's very hard for a professional gamer to make a switch. If he or she has been playing on one mouse for years, moving it becomes second nature." "I've never seen vertical mice used for gaming," said Jason Christian, product manager for SteelSeries. "But it's definitely an interesting concept from what I've read and seen, and it's something we'll continue to monitor." Christian noted that many professional players use low dots-per-inch mouse settings. This equates to low sensitivity, which requires players to pick up and set down the mouse multiple times during a match. A proper gaming vertical mouse would need to account for that. SteelSeries is currently focusing on refining the traditional mouse and keyboard for long-term play rather than rejecting the template altogether. The Rival 310 mouse, for example, is a product of player feedback on the Rival 300. Customer feedback called for better side grips, a smaller body and less weight; the company followed through on these requests. Whatever a mouse's design, any hardware solution to esports injuries must be competitively sound first and ergonomically sound second. There are so few professional players who can make a living as it is, and most players would rather a tournament edge than an unquantifiable injury preemption. In Sept. 2017, one year after he retired, Loomis announced that he was returning to Dota -- not as a coach but as a full-time competitor. He's following healthier habits this time, hoping to prolong this comeback for as long as possible. He does hand-stretching exercises before a match. He takes breaks between sessions rather than powering through the pain and ices down his muscles. And the sessions themselves are truncated. His teammates may play for 12 hours at a time, but Loomis won't play for longer than five to six hours in a single session. Surgery isn't an option; Loomis's doctor tells him that the severity of his arm injury isn't high enough to warrant it. But he is seeing a doctor who's going to closely monitor his health. And thanks to physical therapy, he has much better ergonomics, which he no longer budges on. "Before, I just sat in a chair; I wasn't picky at all," Loomis said. "But now that I've had my arm injury, I'm very aware of what I need in a chair. Having armrests, making sure the chair is in line with the table, making sure there's a backrest. I need good support, basically. If I don't have that, then I don't play at all." But even so, Loomis is closer to the end of his playing career than its beginning. His nickname, Old Man Fear, is a designation of respect, but it also has the ring of truth. Elite sports are a young person's domain. Basketball players retire in their mid- to late thirties. Tennis players often hit their peak in their twenties. Most gymnasts retire in their teens. It takes someone exceptional to push beyond that and maintain optimal performance. 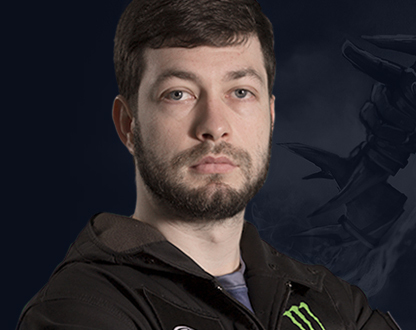 Loomis is a 29-year-old player in a young esports community that grew up watching him. And even if he's gaining wisdom as he's losing his physicality, it'll catch up to him eventually. And because he's seen it happen to other players, Loomis has been preparing for the day he hangs up his gear for good. He's part-owner of Evil Geniuses, which gives him financial security. And he can always return to his coaching role, which suits his even, quiet temperament. But in the meantime, he's grateful for his remaining time as a player and is trying to focus on the present, despite being aware of his limitations. "Playing any sport, or wanting to be a professional athlete, is always going to be a gamble," Loomis said. "And most players who are successful focus on the moment. But when you become older, it's important to become self-aware." Image credits: SteelSeries (Mouse and keyboard photos); Dr. Levi Harrison, MD. (Dr. Levi Harrison, MD. ); Evil Geniuses (Clinton Loomis photos).